We are engaged in offering blood collecction tube labelling machine for safe and virtually maintenance-free handling of goods for diverse application requirements. The in fact, it is built using the most modern micro processor controlled label dispensing system. The blood collection tube labelling machine also includes the latest sensing system for labels, and many other products. It is therefore regarded as the ideal machine for labeling round amoules / vals/ pen /blood coolection tube / small sized bottles, and several other round objects; which are made from glass, plastic, pet, hdpe, pp, etc. This swift and sturdy equipment has the ability to label at the most 300 units in a single minute; based on the diameter of the product and size of the label. Further, the roller spacing device of this totally automatic vial sticker labeling machine, results in a simple no parts change system. In addition to this, it also helps you to do away with the star wheel or feed worm for evenly separating the products. 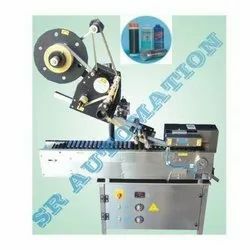 Vial sticker labeling machine is completely automatic and can be operated at extremely high speeds.